Belgard pavers installation marlboro, NJ Beige, Gray all colors available in Marlboro,NJ Poolscapes, Driveways, Fire Pits, Free estimates Grinkevick Lawn & Landscapes can get it done on budget. Pavers are installed on a compacted granular aggregate which should be between 4 and 6 inches deep. The depth of the base layer is influenced by the soil type and application. The base layer should be leveled and compacted firmly, and will safeguard against the pavers shifting or settling. Once the base is in place, a layer of sand is added and leveled or screeded. Bedding sand plays a critical role in ensuring proper interlock between the pavers and allowing for a smooth surface. Bedding sand should be at least 1-inch deep and spread evenly across the base material. Pavers are laid on top of the leveled sand. Polymeric sand is then swept into the joints between the pavers, and a compactor should be used to ensure the sand is evenly distributed into the joints. By compacting, you obtain joints that are nearly 20% stronger. Polymeric sand helps to further lock the pavers in place and plays a critical role in keeping debris and weeds out of the joints. Polymeric sand is specially formulated for the filling of narrow or wide joints when installing pavers, slabs or natural stones. Unlike conventional sand, it stays in place and remains stable. It softens when wet and firms up when dry to better resist soil movements. Discover why so many home owners are choosing Grinkevich Lawn & Landscaping for their paver needs. Looking for top-quality interlocking pavers? You can trust our hardscape specialists to plan and build your new driveway, pool deck, patio, or walkway. 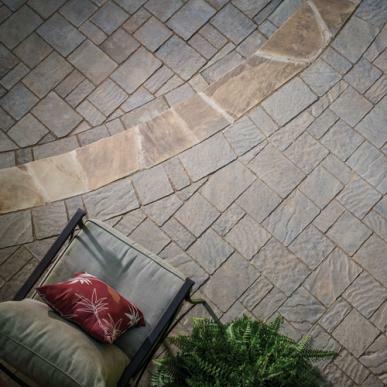 Our unique selection of high-quality pavers will add beauty to your home for years to come. We pride ourselves on all of our projects. Techo-Bloc, Belgard, EP Henry, Anchor and so many more. Pavers add beauty and personality to your landscape and home and provide durability for patios and walkways. We can design and install a walkway or patio to meet your budget and style.